Moments ago our friends over at DKOnPittsburghSports.com broke the hard and sad news: Bob Grove would no longer be doing pre- and post-game for Penguins broadcasts. It's a sad move for anyone who has listened to the Penguins on the radio at any time. There's no way to truly say goodbye, but I'll try. I fell in love with the Pittsburgh Penguins upon Mario Lemieux's return to the ice in late 2000. The first few games of the renewed Mario era were aired on ESPN (now a quaint idea) and from there I was left to fend for myself. Bless my mother, who allowed me to hog the phone lines to listen to the game online via the radio. Two voices were constant: Mike Lange and Bob Grove. As streaming became more readily available, I would listen to more games. I could not afford Center Ice or GameCenter so I'd trust Lange to paint the picture for me. Before games, between periods, and after matches, it was Grove who took the time to talk me down or build me up based on what was viewed through his eyes that night. He was a trusted voice. For those who could not witness the minutiae and intricacies of every game, his knowledgable X and O break down and the key moments were gospel. They were what you'd go tell friends and family when the game came up. They were what you'd take to message boards when break downs were discussed. They were what you believed when you could not see any differently. It was this I took with me when I finally had the utmost pleasure of spending evenings with the man. During the 2011-12 season I was an intern at PensRadio 24/7. On away games I would sit in with Wayne "Gretzky" Anderson and Grover as they spun the dials on the game. Watching the Fox Sports feed as we listened to Mike Lange's radio call was sublime. Discussing the details with Grover as things broke down was beyond memorable. As Josh Yohe says in his article on Grover, he is a Penguins historian. 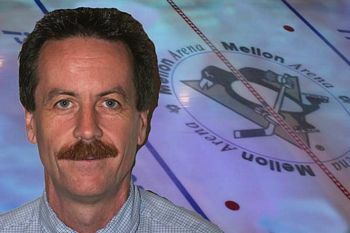 He began covering the Penguins in 1981 as a member of the Washington Observer-Reporter. In 1998 he began doing pre- and post-game coverage of the team on radio broadcasts. For the past eight years he'd been official in studio host. He has seen all of the highs and lows. To recall the times from my blossoming love affair, the Pens run to the Eastern Conference Finals, to the lows of Rico Fata, Kris Beech, and all of the X-Generation, to the current crop, the major players of the Penguins resurgence, was a moment I sat back and said to myself, "Remember this. This is special." Bob Grove was special. He made broadcasts special. Grover is as iconic as Mike Lange and will always remain that way. In the end, radio is a business. It's hard, fickle business. Sports is just the same. The intersection of the two is particularly garish and rough. Another legend of the broadcast has met the fate of many before him. Bob Grove will not be the first icon to go, nor the last. He will, however, be missed. Thank you, Grover. For everything. Wow. How COULD this have come to pass! Will miss him dearly! Oh why? I did so enjoy listening to all his broadcasts.